You are here: Home / Sports / #Royals fan can brag that they have the best catcher in baseball. #Royals fan can brag that they have the best catcher in baseball. Salvador Perez made it to the Major Leagues because of his arm. Perez could clock throws at 1.85 seconds glove-to-glove. The Major League average is two seconds flat. In his major league debut in Tampa, Perez picked off Casey Kotchman at first base in the fourth. In the eighth, Perez threw to third base to nab Sam Fuld, on a failed squeeze play. 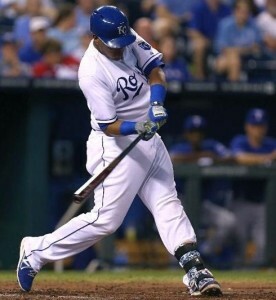 He also picked up his first major league hit in his first game off Wade Davis. In fact, Perez should have been on the field to receive Davis’ strike three pitch to end the 2015 World Series, but Perez was lifted for pinch runner after Salvy led off the 12th inning with a base hit. That opened the flood gates to a five-run inning, allowing the Royals to coast to their first World Series title in 30 years. We all know and appreciate Perez for his amazing defense and his incredible arm, but his offense has made huge strides in the last three seasons, clubbing 60 homers and 204 RBIs. Finally, Perez is recognized as one of the best offensive catchers in baseball. Perez picked up his fourth straight Gold Glove Award and on Thursday was awarded the Silver Slugger Award. Despite hitting just .247, lowest of his career, he topped his career best by one with 22 homers and had his best OPS in three seasons at .725 in 2o15. Perez broke his own Royals franchise record for home runs. Royals fans can say with pride, they have the best catcher in baseball.